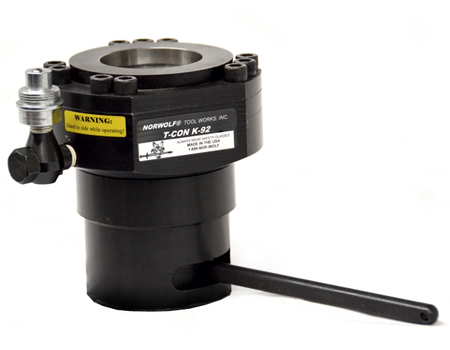 Norwolf T-Con™ Thru Bolt Tensioners are used in bridge construction, wind turbine construction, bridge building and myriad large construction applications. • Operates at only 10000 psi – single line action permits use with any 10K pump. • Custom double stack/double acting available to fit in narrow confines as shown in photos. • Built in safety cap eliminates strain. • Built in automatic spring return. • Choice of pin type or gear driven nut tightening mechanism. • Special configurations, double stack, double acting. For your convenience, please download the T-CON™ Application Sheet below, to send us your most accurate information and to expedite your tool.